North Shore PC would like to make your computing experience fun and rewarding as soon as your system arrives at it's new home. All NSPC custom built systems are pre-tested and ready to run "right out of the box". Because we install all our systems personally ( within 10 miles), we ensure complete satisfaction. This on-line manual will supply you with the basic knowledge needed to setup and begin using your new NSPC computer yourself. In the event it ever needs to be moved or upgraded this knowledge can be invaluable. Modern Computers and software are capable of many things beyond the scope of this manual. Further information can be found in the manuals that accompany your computer or your local bookstore, library or on the Internet. The first thing to do is find a good location for your system. This must be done carefully. Computers can fit just about anywhere, however many places are better than others. Try to find a place that has very little dust, a steady temperature throughout the winter and summer months, and plenty of room for your monitor and printer to breath and cool. You may even want to leave some extra room for any peripherals you may acquire in the future, like a scanner or second printer. Computers and most electronic equipment will last longer if the circuit boards inside them are kept at a steady temperature and never allowed to over heat or suffer surges or sags of electricity called spikes and brownouts respectively. For this reason, NEVER plug your computer into a socket on the same circuit as an air conditioner or other major appliance. We recommend battery backup devices for all desktop computers. Battery backup systems are small and inexpensive and will run your system long enough to shut down properly during short power outages. Try not to place your system in the path of direct sun light. The the monitor can degrade and fade the picture while the heat generated by the sun can actually melt plastic parts or cause the sytem to over heat. If you have purchased a computer for your children to use we recommend it be placed in an open common area of your home. This can help you avoid some of the darker sides of the internet. If you still plan to install it in there room, care must be taken to instruct them in the proper use and care of the system, including the dangers of giving out personal information as well as electrical fire and electrocution if the cords are not properly handled. In addition all Computer systems including laptops must have cooling vents and things should never cover them or be placed into them. Save the boxes in case there is a defective part that needs to be returned. Record the serial numbers from all components. Many of the newer systems do not have all of the features listed below and may have new features not yet documented here. Please do not be concerned if your system does not have all of the features you see here, many are outdated and are no longer needed in the modern computer. It is always best to contact your computer manufacturer before making changes. When the power button is pressed your computer will turn on. Many new system have a sleep button. This button puts the system into a low power mode that is faster to start than a full shutdown. Most Vista laptops have the start button set to put the system to sleep rather than turning it off. To turn a vista laptop all the way off you need to click the advanced shutdown button and choose shutdown from the menu. Many new laptop systems have this switch. If you connect to the internet using a wireless connection this switch must be turned on. Sometimes this switch is a combination of key strokes like holding down the FN key while pressing one of the function buttons while other systems have an actual switch (some might use both). Refer to your manual for the exact position and use of this switch. reboot using the reset switch. Not all system have this switch or button. Make sure that the power switches for all of your components are in the off position. If you are using a surge protector, put its power switch in the off position. You may leave the system unplugged for these steps. "lf it fits, it probably goes there." You may plug the power cords in after you are finished attaching the devices to the PC. Your monitor comes with a cable for power and a cable that connects to your PC. standard electrical outlets or an adapter to plug into the power supply of your PC. connector firmly in place, and tighten the retaining screws on either side of the connector (do not over tighten). The other end of the cable, if it is not permanently attached, plugs into the back of your monitor. The keyboard has only one cable, which is permanently attached at the keyboard. The other end may have a round male connector with a notch for orientation or it may be a USB connector. rotate the connector as you gently push, until the correct pin position is found. 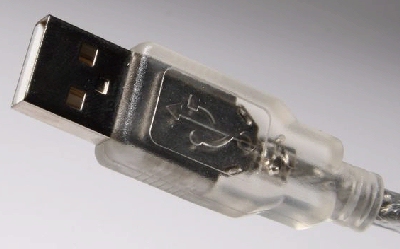 The USB version can be plugged into any of the empty USB slots on the back or front of the computer. standard electrical outlet. The other cable is for communicating with your computer. printers or USB. Serial printers are no longer very popular. Whether a printer is serial or parallel or USB has nothing to do with the printing method. A printer can be laser or dot matrix, and can be connected using either serial, parallel or USB cables. or USB. If it does, parallel or USB is normally the better choice. end has a 25-pin male connector. connector on the back of your system, choose one and test it later. Find the centronics connector on your printer and press the cable firmly in place. Press the mounting clips toward the center until they click into place. Most new printers use the USB connection. When you purchase your new printer be sure it comes with the cord, otherwise be sure to get one that fits your printer. Your PC has a power cord with a three-prong plug that fits into any electrical outlet. you system. The other end has a female plug that fits into the back of your PC. new devices to your system . however most CD-ROM drives have an eject, volume, and headphone connection. DOS prompt to view and run programs on a CD. writeable CD-ROM units are available, but the cost is greater. expansion slot in your PC and is only accessible from the rear. not. To control volume, you must either use the thumbwheel, or keyboard controls. system, they may be permanently connected. 1. To start the system, begin by turning on the main power switch at the voltage regulator, power strip or battery backup unit if you are using one. This will give power to the monitor, printer and other items such as the speakers and scanner. If you are not using a power strip just turn on all of them from the power buttons on the devices themselves. Then press the "On" or "Power" button on the CPU (central processor unit) to begin the "boot up" process and finish starting the system. You will see a black screen with system settings scroll by and then a Windows screen will appear. The process is complete when the Windows desktop and start button appear. 2. To shut down the system, begin by closing all open programs. This is done by clicking on the X in the upper right corner of each open window. After closing all open programs, check to see if any buttons remain on the "start bar" next to the "start" button. If there are buttons, you still have open programs. Click on each, and the program will maximize itself. You will then be able to see the X to finish closing the program. After all programs are closed, click on the start button on the lower left of the screen, a menu will appear, then select "shut down" by clicking on it. The screen will dim and a confirmation window will appear, check that "shut down" is selected and click the "ok" button. After your computer is up and running (see above) you will want to run a program. Programs are also known as applications and they come in all shapes and sizes. There are programs for connecting to the Internet, for playing games, word-processing, accounting and many more. Your Computer works because these programs instruct the different parts of the computer to do things like printing or making a sound. By combining many programs together and letting them run simultaneously, you can create things like books, letters, e-mail, sound files or even just a painting. Begin by deciding what you want to do. Do you want to write a letter, or paint a picture? Perhaps you want to connect to the Internet. As an example we will start with writing a letter. For this we would want to use a word-processing program. Windows 98, XP and Vista come with 2 basic word processors. The one we will use in this example is called WordPad. 1. To start the word processor, using the left mouse button click on the start button in the lower left of corner of the screen. A menu will appear. Move the mouse pointer up to programs and click, another menu will appear, (win98 will run out the menu without a click) move the mouse to accessories and click, another menu will appear, from this menu move the mouse to WordPad and click on it with the left mouse button. This will launch the program and you will see a word-processing program with a blank page ready to type on in front of you. 2. To enter text click on the blank area below the menus and check for the flashing cursor, It will be a vertical bar. Once you locate the cursor and it is in the blank area you can begin typing. The word processor works much like a typewriter with just a few quirks. When you type, the words will automatically wrap to the next line when you reach the right side of the page and you can just keep typing. If you want to force the text to go down to the next line or to create a paragraph you press the enter button and the cursor will drop down one line for each press of the enter button. 3. If you make a mistake you can use the back button to delete what you have just typed. If you notice the mistake in the text after you have typed a long sentence or a full paragraph, or you just want to change what you typed you can use the mouse to place the cursor next to the letters you want to change and then use the back button or delete button to remove the text and retype it. When you are finished typing you will usually want to save the file for use later or printing. 4. To keep the work you just completed and to use it again in the future you need to save the file on your computer hard disk or some other place like a floppy disk or usb external drive. It is also important to save a file several times while creating it because if your computer crashes you will loose any work you have done that was not saved. To do this you need to know a little about how and where files are stored on a computer. Computer systems store data in files using a name and location you choose. Different types of programs store the data in different kinds of files and that is called the file format or data type. When you send a file to someone else it helps to tell them what type of file it is and the program you used to create it. When a file is stored the computer must also know what type of program created it so it can use that program to open it again. This is accomplished by using a proper file name and location. We will discuss the location part later. The file name is important for several reasons. First it helps you find and identify the file again and second it tells the computer what program can be used to open that file. Because of this a Windows file name is made up of two parts. The parts of the file name are separated by a period or dot. The first part of the filename before the dot is for the user, it helps us identify the file. The second part, the part after the dot is called the extension and it is the part that helps the computer know what program to use to open the file when you want to use or view it again. An example of a file name would be: myfile1.doc as you can see the first part of the file name "myfile1" can use both letters or numbers and some special characters can also be used but be careful, not all are allowed. The second part of the file name "doc" is the part after the dot and it is called the extension. This is the part that helps the computer know what program to use to open the file. In this instance the computer will open the file using a word processor because the extension is doc. In the past all windows and DOS computers used file extensions that were only three letters or less long, but now with the new Microsoft office 2007 programs an extra letter has been added to the extension. (other types of computers may or may not use extensions and your windows computer may not be set to show you the extension, if yours is not set to show the extension you may want to change that setting) You can tell if someone has sent you a word document in the new file format because it will have the extension ".docx" instead of just ".doc" after the first part of the file name. Other programs use different extensions. The Microsoft spread sheet program called Excel uses the extension .xls and the new Excel 2007 program uses .xlsx. Many photo programs and digital cameras use the extension .jpg when they save a picture. This is a link to a site with many of the common extensions. Now that you know what makes up a proper file name we can move on to how and where to save your new file. 5. To save a file on your computer after creating it in a program like a word processor you will have to use the menu bar at the top of the screen. In our example using the Wordpad word processor you would click on the menu item "File" at the upper left of the Wordpad window using the left button on your mouse. Once you click on "File" a list will drop down with about 10 items in the list. One of the choices will be "Save" and another of the choices will be "Save As". The very first time you save a new file you will always want to use the "Save As" choice. This will allow you to give the file a name and it will let you choose where to save the file. If you just click "Save" the first time after creating your file your computer will give the file a generic name like "document1" and you may not know where the file was saved on your computer. The "Save" command is only used after you have used the "Save As" command to name your file and will then use the name and location you choose using the "Save As" command every time you click "Save" in the future. To continue with our example click on "File" in the upper left of the Wordpad program window and then choose "Save As". A new window will come up and in it you will have a place to enter the name for your document and a choice of where to save it. By default most word processing documents will be put in the "My documents" folder on computers running windows xp and the "documents" folder on computers running windows Vista. For now we will not worry about how to change the location of where the file will be saved, just take a look at the location to be sure it is going to the default place like "My Documents" or "Documents" and then type in a name for the file and click "save" in the "Save As" window. The window will close and leave you with the program running so you can continue your work. If you would like more details on using a program you can click on the menu Item "Help" at the top of the program window and a window with help documents will come up. When you have finished working on the file you can close the program by clicking on the X in the upper right corner of the program window. To work on the file again you will have to open the program again from the start button and then choose "File" from the top left menu and then "Open" from the list. You should see the file you created listed. Click on the file and then click on "open" and you will see your work in the program. If you have a printer connected to your computer you can also print. Click here to save a copy of the word processing tutorial on your computer. It is a Microsoft word document. cardfile.exe (the program) and cardfile.hlp (the help file.) Click on these links and you will be asked what you want to do. If when you click on cardfile.hlp you only get a page of code, try downloading it by right clicking on the link above and then chose "save target as" and place it with the cardfile.exe file in the windows directory. Once you have downloaded both of these files, using the explorer, or my computer, locate the file cardfile.exe in the windows folder and double click it to start the cardfile program, or create a short cut to it on your desktop for easy access later. Remember, the cardfile help system is only accessible by clicking the word help form the file menu while the cardfile program is up and running. If you would like to download both programs at the same time please click this link to the ZIP file "cardfile.zip" you will need winzip or some other unzipping software to open the file. Many people have had problems running this version on Windows 7 64bit computer systems. That is because it is a 16bit program. Microsoft created two versions of the program. A 16 bit that came on Windows 95 and 98 and a 32 bit version that came on Windows NT systems. The 32 bit version will run on Windows 7 64bit systems, but the help file does not work. Click here to download the 32bit version of Cardfiel.exe. PowerPoint is a slide show presentation program from Microsoft. If you do not own the program you can use the free PowerPoint viewer to view PowerPoint files created by others. You will not be able to edit or make changes to the files, but you will be able to view the entire slide show including sound. If you would like to view PowerPoint files, download the file by clicking the link and then installing the viewer on your computer. Click here to download the PowerPoint viewer. If you are having trouble accessing the internet, but you could access the internet without trouble in the past, you might want to try refreshing your IP address (think of it as your computer's name on the network). If you are using Windows 95/98/ME, click the Start button, then click Run. In the "open" field, enter "winipcfg" (no quotes). Once the IP address window appears, select your ethernet card from the dropdown list, and click the "Release All" button. Once the numbers in the window are reset to zeros, click the "Renew All" button. It might take a few minutes for your computer to respond to the buttons; don't click the buttons more than once! If you are using Windows NT/2000/XP, click the Start button, then click Run. In the "open" field, enter "command" or "cmd" without the quotes. On the prompt line, type "ipconfig /release" (no quotes space before /). When the prompt appears again, type "ipconfig /renew" (no quotes space before /). Once finished, type "exit" in the prompt line. If you have any questions, call North Shore PC at 847-966-1044. We are located in Morton Grove IL. and service most of Chicago and the northern suburbs. You can E-Mail us at NorthShorePC@aol.com by clicking on this mail link, or you can call us direct at (847)966-1044. Our hours of operation are 7:00am to 7:00pm. We also offer 24 hour emergency service. Don't forget to back up your hard disk. You never know how much you need it until it's gone! TO THE SEARCH ENGINE OF YOUR CHOICE.